﻿ The Legacy award is our highest honor recognizing lifetime achievement in merit shop contracting. It is Ohio Valley ABC's equivalent of the Academy Award or Heisman trophy. 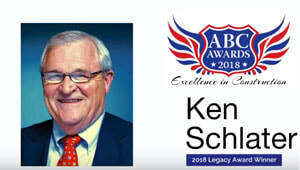 Ohio Valley Associated Builders and Contractors (OVABC) is proud to recognize three individuals as finalists for the prestigious Legacy Award. Each year, OVABC board members solicit from member companies - names of potentials nominees for the award. Submitted names are evaluated and voted upon by the board and a shortened list of nominees is assembled. All the nominees are announced at the OVABC Legacy Golf Outing, and each is subsequently invited to complete and submit an application packet for the award. From these submissions, the OVABC Legacy committee narrows the field to three finalists. By secret ballot, members of the OVABC Board of Directors vote for a single individual and the ultimate winner of the OVABC Legacy Award is announced at the Excellence in Construction Awards Banquet.